Governor Cuomo can't promise that Amazon won't make Queens subway rides even worse than they already are. Laughter erupted at Tuesday’s Amazon’s Long Island City announcement when Streetsblog asked Gov. Cuomo to promise Queens’s already-miserable straphangers that the sweetheart deal with the retail giant won’t make the subway system he controls even more miserable. Amazon’s impending move to the East River end of 44th Drive is expected to bring at least 25,000 new jobs — and more of a crunch on the subway and buses — to the neighborhood. The influx terrifies Queens residents — one of whom made her opinion known after Streetsblog raised the issue at Cuomo’s Midtown office. “Subway rides are already miserable!” April Simpson, president of the Queensbridge Houses Tenants Association, shouted from her seat. Cuomo didn’t bother to respond to Streetsblog or to Simpson, tossing the issue to Long Island City Assembly Member Cathy Nolan, who argued that commutes won’t get worse because many of Amazon’s employees will live in either Manhattan or Long Island City itself. “You’re going to have a certain amount of reverse commuting,” said Nolan. And with that, Cuomo ditched the press conference, leaving Mayor de Blasio to fend off reporters. There’s no doubt that Amazon’s incursion into Long Island City will strain the transit system as the initial workforce of 25,000 — and the eventual staff of 40,000 — makes its way to the new complex, which is about four blocks from the E,G and 7 trains at Court Square. The memo-of-understanding between Amazon and the city and state [PDF] requires that online retailer to contribute “payments in lieu of taxes,” or PILOTs, for the land it will occupy. PILOTs are supposed to be pegged to property taxes in the neighborhood, but rarely are. Half of the PILOT money will go into an infrastructure lockbox managed by the city’s Economic Development Corporation. Deputy Mayor Alicia Glen said that the fund would grow to $600 to $650 million over 40 years. At most, that’s $16.25 million per year — a pittance compared to what the transit system needs. The MTA’s construction wish list is currently $60 billion. Its annual operating budget is $16 billion — or 1,000 times bigger than Amazon’s annual contribution will be. Think about it: Thanks to the Amazon deal, the mayor is again hyping his Brooklyn-Queens streetcar, which would pass the Amazon corporate site on its way from Astoria to Gowanus. Its construction budget alone is $2.7 billion. That price represents 166 years of Amazon PILOT contributions. If public reports about this deal prove true, we cannot support a giveaway of this magnitude, a process that circumvents community review through the use of a GPP or the inevitable stress on the infrastructure of a community already stretched to its limits. Wait, so PILOTs are bad? Speaking to reporters after the press conference, Glen said the PILOTs would be pegged to area property taxes, which will be determined by the city’s Department of Finance. The city estimates that will provide $32 million per year over four decades. Glen insisted that Amazon would not be able to skirt its obligations to state and city coffers. More often than not, however, PILOTs don’t reflect actual property tax rates. Across the city, powerful corporations have avoided paying tens of millions of dollars in annual tax revenues ‚ and it’s been going on for years, as Juan Gonzalez described in the Daily News a decade ago. And when PILOTs were used to help Bruce Ratner build his Atlantic Yards project a decade ago, they benefitted the developer. Years later, when few people were paying attention, Ratner sued to get his PILOT obligations reduced. In the Long Island City deal, state and city subsidies will add up to $3 billion and, the city and state believe, will generate $10 billion in new tax revenues over the next two decades. That’s not good enough, some local officials say. Sifuentes blasted Cuomo and de Blasio for letting Amazon off the hook on state and city taxes. “Riders would be better served if Amazon paid taxes like everyone else, rather than … funnel [its] tax revenues into nicer sidewalks and ferry services for [its] employees,” he said. Fortunately, nothing is set in stone, and the city and state will negotiate the final terms of the deal over the next 16 months. At Tuesday’s MTA board committee meetings, Long Island City residents bemoaned the coming deluge — and called on board members to fight to ensure Amazon provides much-needed subway funding. The closest train station to Amazon’s new headquarters is at Court Square, which is also the location of one million square feet of office space Amazon just leased as a temporary home. The Court Square station serves nearly 24,000 daily riders, according to MTA data — a 15 percent increase over the last five years. Streetsblog should be supporting multiple mass transit ideas. The Brooklyn to LIC waterfront tram is a great idea, even with the support of the evil real estate developers who don’t really care about mass transit. The tram would solve a lot of issues for people who live in Red Hook and Greenpoint. The only people who strongly oppose it are those who park on the streets. And it’s cheap enough for Mike Bloomberg or Warren Buffet to finance themselves. We should also be supporting MetroCard acceptance on the new(ish) ferries. And of course, we need a rebuilt subway system. The MTA is too modest. $60B covers only a fraction of what needs to be repaired or built. It’s over $100B if you factor in 100% signal replacement, full ADA compliance for all below ground stations, flood resistance engineering, future rolling stock commitments and station renovations. And of course, every project goes over budget. We have to factor that in as well. Expanded bike/ped paths on the Koch/Queensboro Bridge will be necessary. Many Amazonians will live in Manhattan and commute to LIC. The existing bridge path is already way too crowded. Anable Basin is the future site (not sight) of Amazon’s New York headquarters. A letter of intent is NOT a lease, and only room for 1100 workers will be made by 2020. As with most of the “tech world” today, alot of promises. “Amazon plans to lease 1 million square feet of office space at Savanna’s One Court Square in Long Island City, Queens, the landlord announced in a press release today. 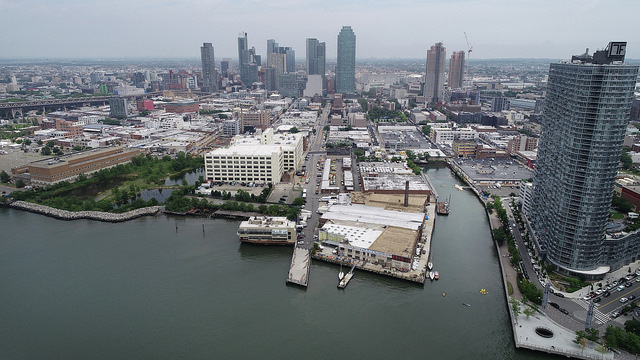 tower as it formally announced its intent to build a new headquarters on Plaxall Realty’s Anable Basin site on the Long Island City waterfront. We should be thinking big for LIC. We’ve lost just about everything we had as far as affordable apartments. Not just here in NY, but nationally, as well as internationally. We’ve lost history, all because of rampant development, as well as greed and corruption. Buildings that were demolished that could have been renovated are now lost, because politicians such as Andrew Cuomo and Bill DiBlasio made secret sweetheart deals with corporations including Amazon. Tenants lost their homes to developers such as Bruce Ratner. Bill DiBlasio made deals with private developers supposedly to benefit NYCHA tenants. The same developers who will get tax breaks etc. This is nothing new Robert Moses is responsible for the destruction of buildings for his highways etc. In the 70’s under the guise of urban renewal which were supposed ro improve things, opened the floodgates for developers and landlords such as Jared Kushner, who victimize tenants. At the time that this was going on no one spoke up until it was happening to them, now it’s too late, and still no one says anything, because they can afforf yo move in and raise their families in newly built condos and coops. I see them everywhere wheeling their baby strollers or have their babies strapped to their chest, wering their ubitiquitous backpacks. Can you really be surprised at What Amazon managed to pull off? Where is the outrage? Would anyone like to know who has the top job on the landuse committee? None other then David G. Greenfield council member on the city council, whose constituents have been benefitting very well because of him, and will benefit even more with the housing he intends to get for them once the deal with Amazon is solidified. Could an "infrastructure fund" help ease the burden of having 25,000 Amazonians move to Long Island City?